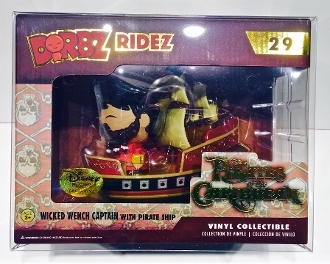 1 custom made box protector for the new taller sizes of Dorbz Ridez like Moana, Disney Pirates Wicked Wench and Aladdin. There could be others and let us know if you know of others that are the same size. This will not fit the Dorbz Wonder Woman Invisible Jet, Dor or any other Dorbz Ridez that isn't listed above that we know of. We do have the standard size also listed that will fit the majority of the others. These protectors are 8 9/16 x 6 11/16 x 5 5/8 or roughly 21.8 x 17 x 14.3cm.